Big things were bubbling in Brooklyn two years ago. The year 2017 marked the 50th anniversary of Bedford-Stuyvesant Restoration Corporation, the first community development entity established in the United States. The nonprofit outfit has provided housing, employment, training and culture to residents of Bed-Stuy since 1967; 2017 was also the year the Restoration’s Billie Holiday Theatre reopened after a multi-million-dollar renovation. 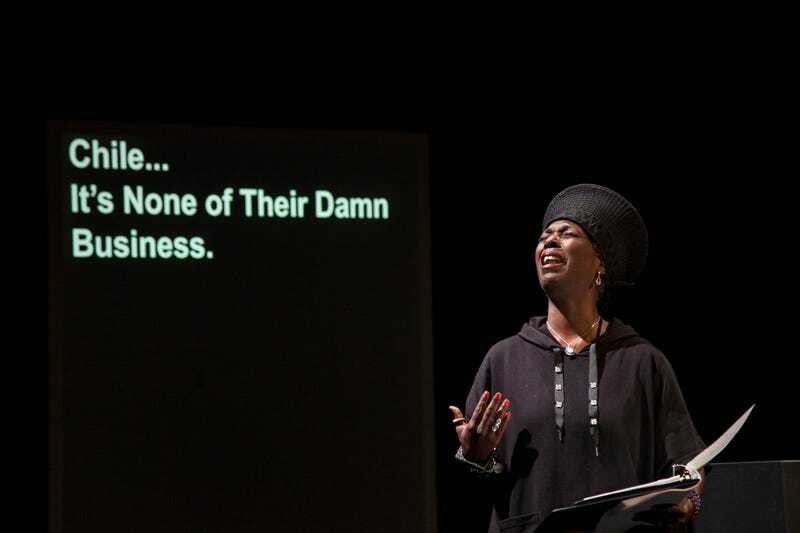 And it was in that capstone year that Dr. Indira Etwaroo, executive director of the Billie Holiday, realized that the very voices of black women on stage were but mere whispers. “In looking back on the history of our theatre, particularly black theatre, with the incredible diversity that we put on our stages, it seemed that we were still struggling with presenting the voices of women playwrights,” Dr. Etwaroo told The Root. And so, as it was the 50th anniversary of Restoration, Etwaroo played with the idea of getting 50 stories from 50 black women. She reached out to genius playwright (and recent MacArthur Fellowship winner) Dominique Morisseau and asked her to craft a curatorial statement with a call for writers. That, coupled with a social media push, netted more than 200 stories from black women from across the world, which was subsequently culled to 50. “I didn’t go in with the lens ‘what is the best story,’ but rather which 50 stories best represent the exquisite diversity of black womanhood and our voices?” explains Etwaroo, who conceived of and directed that inaugural production, 50in50, which unpacks the monolith that is black womanhood by pairing the words of black women writers with the actresses who speak them. Each year, the theme changes. Initially, it was 50in50: Writing Ourselves into Existence; in 2018, it was 50in50: Where Do We Belong in the Movement— speaking to the #MeToo Movement, the Civil Rights Movement, the Women’s Right movement and the 100th anniversary of the Suffrage Movement of 1918. “Somehow, in all those movements, the voices of black women were fairly invisible,” muses Etwaroo. And that is not only an issue but a travesty, because black women are the “very fiber and fabric of what it means to be American,” she says. And, as she notes, 2019 is an auspicious year. In 2019, the title was 50in50: Letters to Our Daughters. Etwaroo has two daughters, ages 22 and 16, and tried to find work that would resonate with their age group. This year, the production moved from the Billie Holiday to downtown Brooklyn’s Kumble Theatre; the next week, it played two sold-out shows at Los Angeles’ Waco Theater Center (founded by Richard Lawson and Tina Knowles-Lawson). The production is looking to expand to a multi-city tour next year. For the last three years, actresses such as Pauletta Washington, Phyllis Yvonne Stickney, Marsha Stephanie Blake and Celestine Rae have taken part. This year’s New York run also featured Angelica Ross, Jasmine Cephas Jones, Ebony Jo-Ann, LaChanze, Terria Joseph, and Michele Shay. The Los Angeles run starred: Nicole Ari Parker, Vanessa Bell Calloway, Angela Gibbs, Xosha Roquemore, Courtney Nichole, Marla Gibbs, and Terria Joseph, among others. 50in50: Letters to Our Daughters was an emotional journey. There were moments that elicited laughter, tears, song (three-time musical director Maritri Garrett, a pianist, guitarist and percussionist, made it more than easy). There were stories of love, of loss, of heartbreak, of wanting babies, of not wanting them, of regret, and of wisdom. For the first time, the production cast a trans woman actress, Angelica Ross, (Candy Abundance in Pose), who read cis as well as trans stories. Dr. Etwaroo says as the production evolves, it will continue to open up space for what black womanhood is. This year, the 50in50 featured a white woman for the first time. For people who want to participate or learn more about 50in50 next year, check out the Billie Holiday Theater.